Win a rolly-polly kitty--this sweet cat "Mews" when cuddled! Last month I drove down to Philadelphia to visit a dear friend who was in town for a conference. While she was at the conference, I had fun bopping around the city. I had no plans to do any shopping. That is until I came upon the Omoi Zakka Shop. 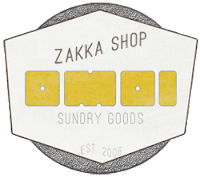 The tiny store is packed with unique and adorable products--everything from lifestyle items, men's and women's clothing and stationery. Omoi is based on the Japanese zakka shop and features "anything that enhances your personal space, your life or your appearance." The owner and curator of the shop, Liz Sieber, loves cats. It's pretty obvious from all the cute cat items that the store offers. Liz is owned by Yuki, which means "snow" in Japanese, although she's an all-black cat. Liz is warm and welcoming, as is her staff. I highly recommend stopping at this charming treasure shop if you are in town. A reviewer from Yelp said Omoi is, "a little slice of Tokyo in the heart of downtown Philly." Below are just a few of the kitty items the store sells. I bought 3 adorable rolly-polly "Meow" egg kitties. I had to have one, so one for me. *Smile. * One for my sweet niece who has 2 cats. And a chance for you to win the one in the above video, my friend. Just leave me a comment and tell me who it's for. 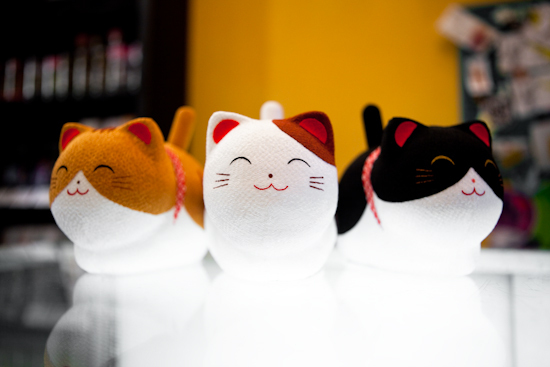 The Yura Koro Tamago egg kitties "Meow" for attention and when you cuddle them, they give a happy "Mew!" I'll throw in these fun kitty stickers I bought at Omoi, too. The solar-powered "Maneki Neko" is Liz's favorite kitty-related item in the shop. She said, "Each one is made in Japan with kimono silk bodies and solar powered tails, and are inspired by Japanese maneki neko, (traditionally these are shown with a waving paw, rather than waving tail). The white kitty welcomes good luck, gold welcomes good fortune and black welcomes good health." Contact Omoi for more information on the Maneki Neko. 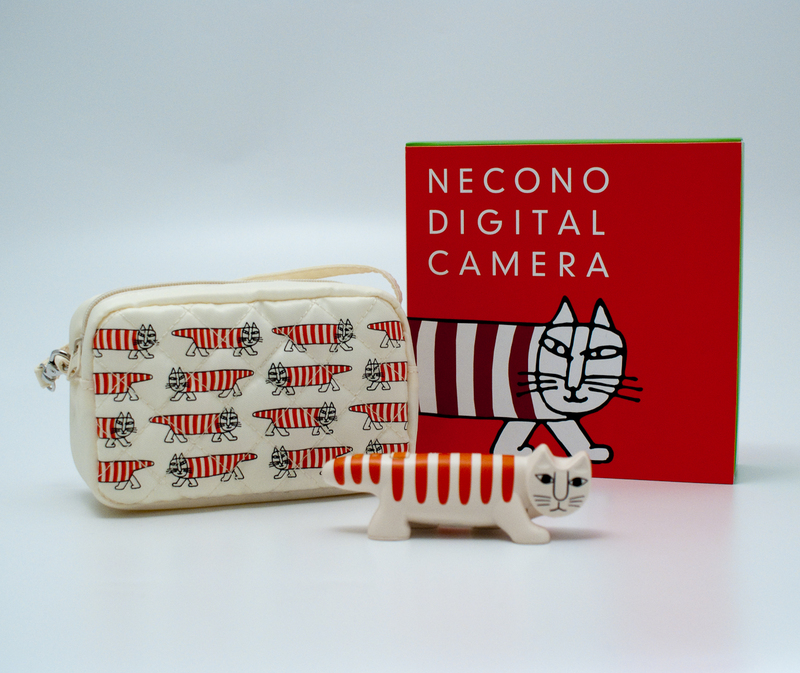 Ceramic Necono Digital cat camera with pouch. 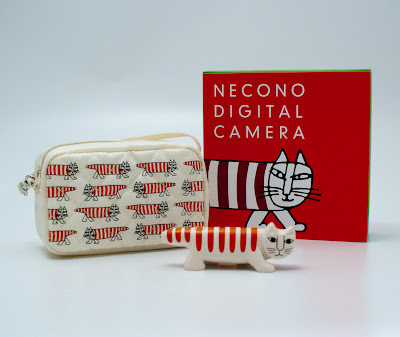 The Necono Digital Camera is the sweetest little camera you've ever seen. The camera, in the shape of a mod striped cat, takes both regular photos and video. The cat has tiny magnets on its paws so you can place it in unusual spots. You'll have to wait until you unload the photos on your computer to see what you shot. Watch the video to see how the camera works. 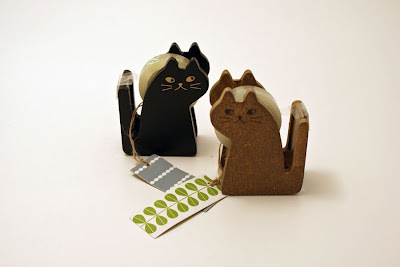 These wooden cat tape dispensers have purrs-onality! How can you resist these wooden scotch tape dispensers in the shape of a cat. Office work will be so much more fun. The dispensers are available in black wood or natural. The store wrapped up my purchases, in nice Japanese presentation style. I'm looking forward to going back to Omoi! Win this "Meow" kitty by entering the Giveaway. At the end of this post leave a comment and tell me who the rolly-polly "Meow" kitty is for. Note: In the comment section, if you don’t have a blog: Just fill out “Name/URL.” Please give me your full name to avoid confusion. Contest Ends: Thursday, November 10, 2011 at 11:59pm (EST time). The winner will be chosen randomly. I will post the name of the winner on this blog on Friday, November 11, 2011. If you don’t respond in 5 days (I will post my email address that day), then I will choose another winner. "paper bag & string" giveaways are solely sponsored by Ann Dziemianowicz, and are NOT sponsored, endorsed, administered or associated with any online social networking sites. Comments are now closed for the giveaway. Thank you. Click HERE to see the winner of the Meow Kitty giveaway. store front, solar-powered welcoming cat, Necono Digital camera and logo: all used with permission of Omoi. I'd love to win! So adorable! And it would be for me, actually. I love kittehs more than anyone else I purrsonally know. i am in love with this!! i right now am without a cat because i had to move to a cat free place so until then i'd love to have a teeny tiny mewing kitty to keep me company until January when i can get a kitty! also i just really love adorable wacky things. I would love to win this for my little sis who I inspired to become a "cat lady" at just 7 years old. She loves to send my husband and I cat cards filled with cat stickers! I have a cat named Verdi that loves things that make noises and mew. She snuggles up to them because she wants them to feel happy. She is pretty sick right now and I think she could use a friend besides her hyper sister, 'Zilla. It's for me! I just got the cat piano app for my iPad. Watching our cats respond to the meowing/music is hilarious. I can only imagine their reaction to the "Meow" Kitty. This is so insanely cute! If I didn't keep it all for myself, I'd give it to my sister. She love cats as well as all things Japanese. honestly I would love to win, but I'd like to give it to my mom. She was diagnosed with overian cancer last month and honestly I think something like that might be kind of a small thing to cheer her up and perhaps a reminder to keep fighting and not to fall down. What a wonderful shop!!! How super cute! I'd never leave that shop - they'll have to throw me out! LOL! What adorable items! We won't enter the draw, but will wish everyone else the best of luck! Oh boy...one of my best friends would go crazy for a magical mew kitty! That would be a swell Christmas gift for her. I would love to win this for my boy Joey, a true kitty lover! My name is Lauren Noelle Schmidt (my WordPress blog username is different). I studied Japanese in college, and developed a love of the culture as well as the language. I wish I could win a Maneki Neko, too, but I mustn't be greedy! I would give this to my daughter to keep her company while she's away and missing her kitties at home. That is just beyond cute, and I would love to win it for ME, because I am the craziest Crazy Cat Lady I know! My little troublemaker, Max Factor, would be the recipient of this wonderful prize. It might keep him out of trouble for a while as it makes the cutest noises ... only second to his little chirps and mews. What a great store, and such cute products! We would take that roly-poly cat to the shelter ... the kitties there will love it! Oh how cute! Those cats get all the cool stuff! i wanna give this to my friend who just got 2 cats, she would love this! It would be for me because I have never had something like this before . Cute!!! I've been to Philadelphia twice in the past. 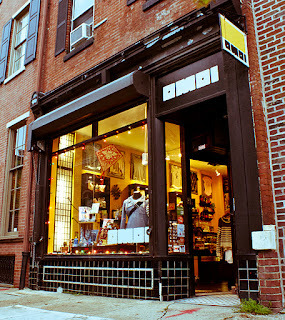 If I knew about this store, I sure went! If I was to win this, I would give if to my friend Hannah as a part of her Christmas gift. Out of all of my friends, all of whom love cats, she is the craziest about them. She collects pictures, postcards, cat toys, and even paints pictures of her own cats. She is so in love with her cats, she makes them boxes for them to sleep in for Christmas and their Birthdays. I mean, I love my cat, but the effort she puts into making sure they feel absolutely loved is amazing. I would love this giveaway fro myself, but i feel she would appreciate it even more. Good luck to everyone! OH MY GOSH! That little kitty would be for me! I could SQUEEE at it all day long! I bet my cats would like it too. They liked the stuff kitty that meowed when they batted at it. For my 20 yr old daughter, who loves everything Cat AND Japanese related! Meow! it would have to be for my wife, she does so much for others it would be great for her to get this, not only because we love cats, we have a houseful but she love hello kitty and the whole Japanese kitty fanzine. If we won the rolly polly kitty, we would give it to our mom. We know she would love it! Not as much as us, though. How much movement is is required in order to make the cat meow? I work with children with severe profound disabilities and this looks like something they would be able to hold and possibly activate if it doesn't take much movement since they have a hard time holding anything or moving. I would give this to my grandma and grandpa (and their cat)!! Well, we're a cat loving family, but truth be told, it'd probably end up going to my cat loving daughter....and her 3 cats.